The National Premier Soccer League, commonly known as NPLS, is the fourth tier of the US soccer pyramid. It is together a regional and a national league, meaning it is divided in 4 regions (Northestern, South, Midwest, Western) that represent the whole country. It takes place in the summer months, so they can draw players from NCAA soccer. I quite like their new logo, so I designed coordinated logos for the 4 regions and 13 conferences. The four regions have different stars positioning to represent the geographical positon, but they are always 4, as the regions. 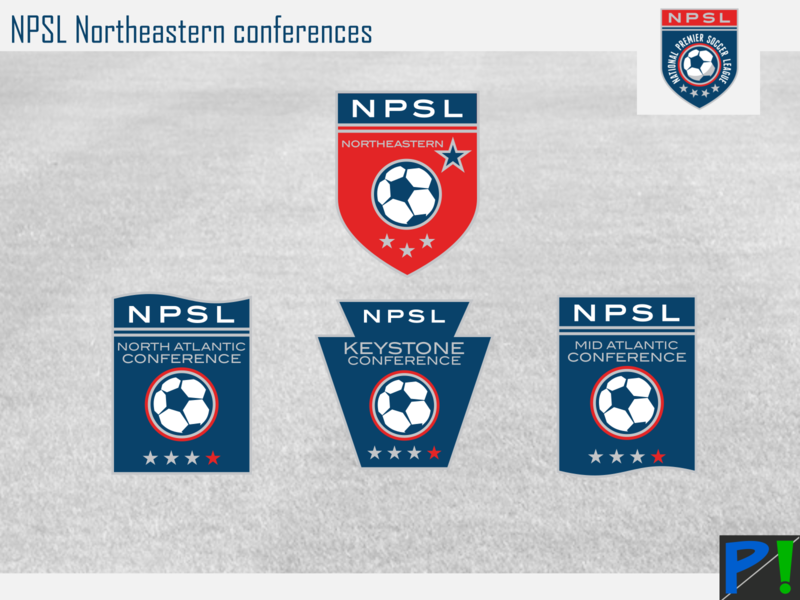 The conference logos have a similar appearance, with only a different crest shape. Of the 4 ever present stars one is red, representing which region the conference is in. Southeast has a flag shape, for all the pirates that had their coves on the south eastern coast. Great lakes has 3 red stripes and two blue ones to represent the 5 major lakes. I designed the kit for the two diffent all-star teams of the league. The all-star game is actually called Rising Stars National Game in my redesign. Two regions will play against the other two regions; the couples will be decided by a draft on the game's eve, so every region sends the same number of all star players to enable every combination. 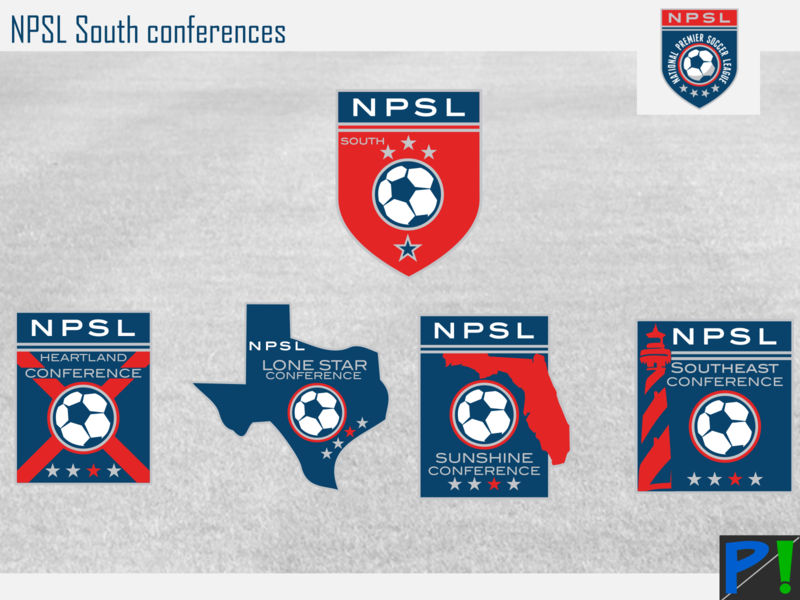 These are great except in not sure what the shape of the southeast conference logo is supposed to be representing? 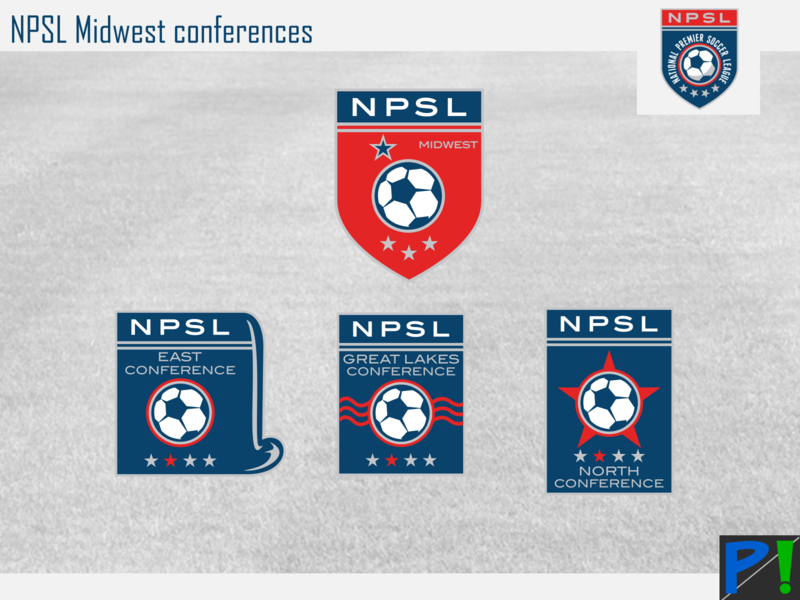 It hurts my head that the North and East conferences are in the Midwest, and not in the Northeast. 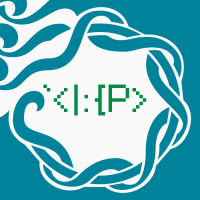 That said, it's hard to tell what the shapes are for some of the conferences. For example, the Southeast doesn't read as a flag at all and the Northwest doesn't feel like a tree. Then some of the others feel very generic, like the Mid- and North Atlantic, and the North. Some look really good (like Keystone, Sunshine, Golden Gate) but feel really separate (due to their higher quality) from the rest. To fix that, I'd suggest maybe keeping the shape and star arrangement the same as the region logos, but move the soccer ball to on top of the shield, and add the unique elements to the center. 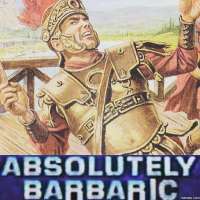 I'd recommend a map of the Great Lakes for that conference, the Little Dipper for the North, skyscrapers for the North Atlantic. As for the Rising Stars, it looks fine as is, but I'd like to see each region with its own team in a mini-tournament! One dark gray, one blue, one red, and one white jersey should work fine. There are some good ideas here; it just needs some rearrangements! Heartland wordmark got a new placement as did the Sunshine wordmark. For the Southeast I decided to go with Cape Hatteras lighthouse silhouette. New North Star shape for the North conference. Southwest conference wordmark got a new navy background to make it more visible on the sun rays. Northwest pine tree has been redesigned to look more the part and the upper part resembles now the northwestern-most part of the state of Washington. Logo: I stayed with their current one as the new take on their traditional logo is absolutely awesome. Kit: I pushed the italian feel a little more, adding many green and red hints. Brooklyn looks great! my only suggestion would be to add a bit of white above the red and green stripes on the home, it would match the logo more. Logo: I retained the actual logo design, but adding orange to make it pop more and to tie it with the dutch origin of Kingston and the Stockade. 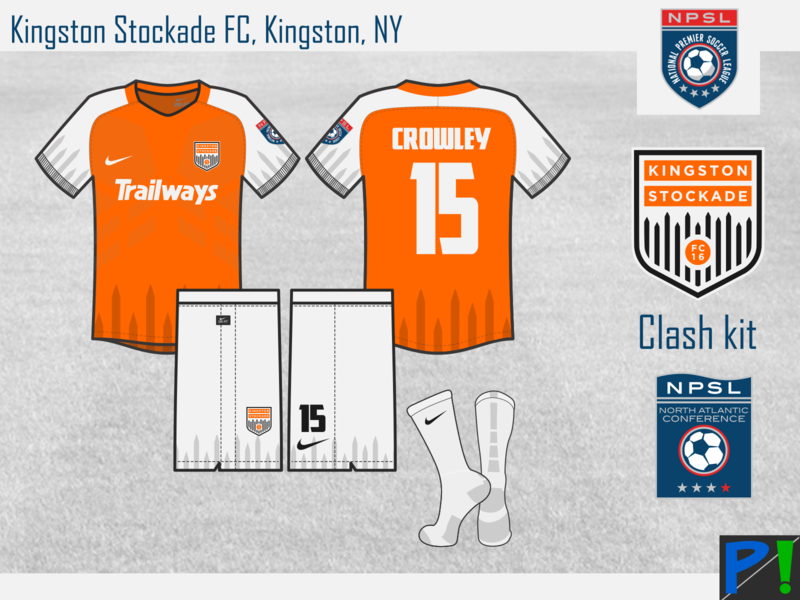 Kit: I added a stockade pattern as featured on the crest, though for the clash kit I went with a more sublimated look, to underline more the orange, symbol of the dutch national team. 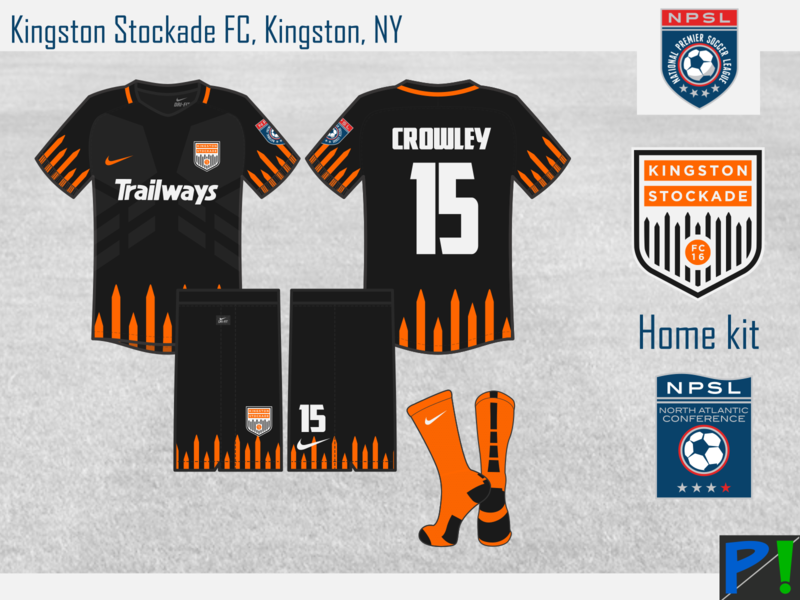 Kingston kits are great but not huge on adding the orange to the crest. Looking forward to the rest of the series! 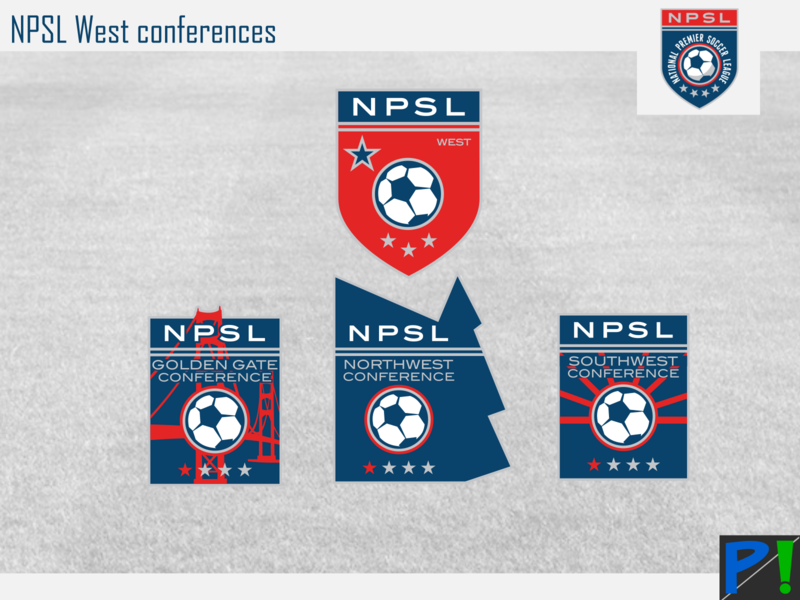 Love that NPSL is getting the all-star treatment. Motto: "Of the People, By The People, For the People"
Logo: I used their current shield shape and skyline pattern for my logo, changing the rampant lion and eliminating once and for all the football that looked like it was just photoshopped on the logo. Kit: The home kit is a nod to the USA national team popsicle look, the bold move is to invert the color scheme on the shorts. 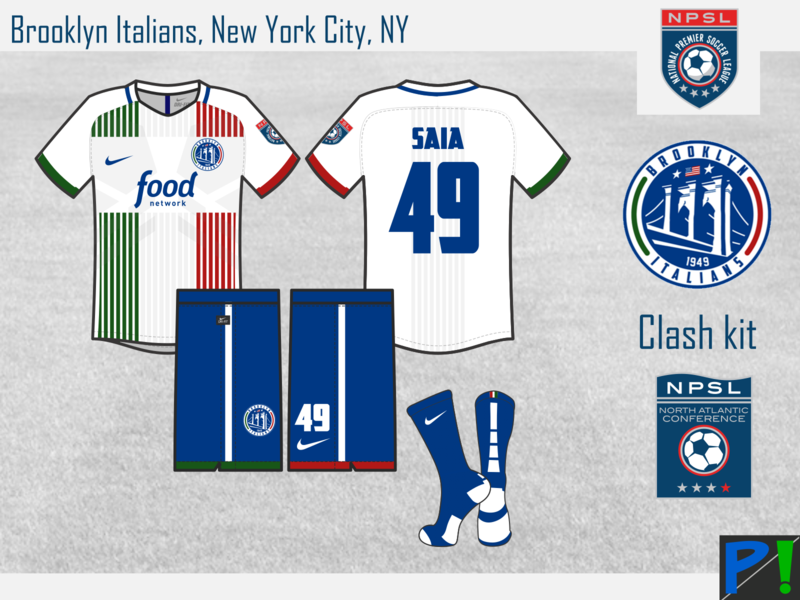 The clash kit is a reference to the New England Flag with the red and green scheme. A sublimated araldic lion was added to the jersey to remind the ride of being part of Boston City FC. Logo: The New York Cosmos logo is iconic and has some history over its shoulders, so I decided to use it as it is, not even tweaking the stars on the ball that were added at the time of the first NASL. Kit: I went with a navy main kit, with little nods to the tri color wave. The clash in in the traditional colors of white and green, with a sublimated wave. Did Cosmos B ever wear that solid green Nike kit? Isolating the motion lines is an interesting concept, but I don’t think it’s effective without the ball. It’s not a “wave”, which probably could stand on its own, but is supposed to indicate the spin of a ball. Like the grooves in Bond’s gun barrel. I know I said wave, but it was for semplification's sake. I thought that those graphic signs were either the spin of the ball or a nod to something ''cosmic'' like the tail of a comet. Either way, I liked the idea to have it on its own, as I tried it with the ball and the jersey looks a lot messier (Messi... maybe it is not bad for a soccer team ). Logo: I revisited the old logo, modernising the winged foot and adding the stripes for a more football oriented crest. I also added gold to the color scheme to enhace the laurel wreath, to simbolise the history of NYAC. Kit: The home kit has an Atletico Madrid vibe, with the red and white striping, but has an unique idetity with the addition of the golden trims. The clash is all on gold, simple in appearance to make the colour count more than the design, as gold represents all the olympic athletes that played in the many sports branches present in NYAC. That looks more like a university seal than a soccer badge. I think you've got a good start here, but it needs some tweaking. The laurel seems wholly unnecessary and your wingfoot should probably be the focus. Also, are you married to those colors? I would suggest blue and orange. The colors of NYCs flag as well as the Mets, Knicks, and Islanders. They look great together and scream NYC. The Wingfoots have always worn red. are you married to those colors? I would suggest blue and orange. 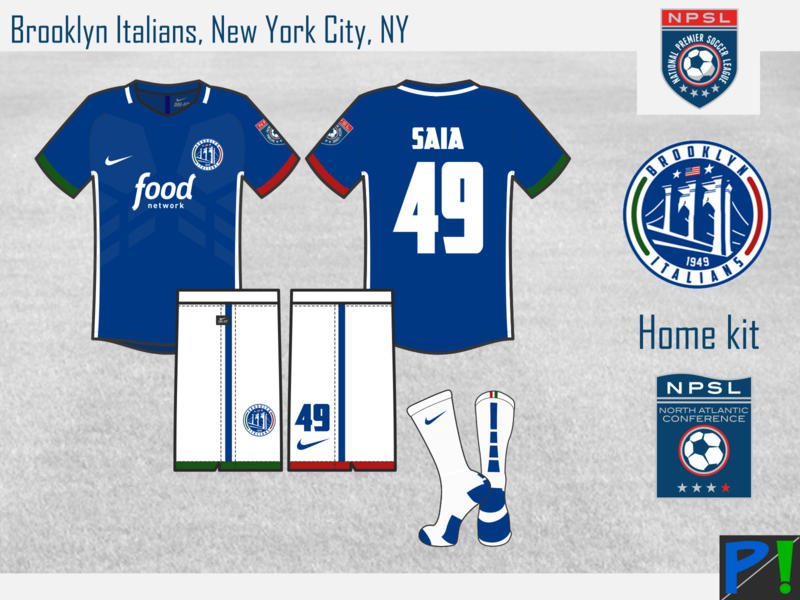 I'm trying to use as much as possible the original color scheme for every team, in case just adding new colors, so, New York traditional blue and orange could be good, but a big departure from the red jersey usually worn by the NYAC. The laurel seems wholly unnecessary and your wingfoot should probably be the focus. Maybe a bigger winged foot could upgrade the logo, I'll be working on it. The laurel is an homage to the history of the club and , yes, it looks like an academic thing more than a soccer badge, but in this way it looks a lot more like european soccer badges, as in many cases the teams were founded inside multisport associations exactly like the NYAC, at times with an academic background.